The Economic and Financial Crimes Commission (EFCC) has arrested Austin Umahi, brother to the current governor of Ebonyi State, David Umahi, along with two others Chinyere Egwuche and Mabel Dikibo over a N400m slush fund linked to the 2015 presidential campaign of the Peoples Democratic Party. The suspects, all staff of Brass Engineering & Construction Nigeria Limited and Osborn La-Palm Royal Resort, were arrested for refusing to honour invitations by the EFCC over an ongoing investigation of both companies. While Austin Umahi doubles as chairman of both companies, Chinyere Egwuche and Marbel Dikibo are also signatories to the companies' accounts. EFCC investigators alleged that the Director of Finance of the PDP Presidential Campaign Organisation, Nenadi Usman released N400m to the Ebonyi State chapter of the PDP for the 2015 presidential election. The said fund, the investigators said, was moved from Fidelity Bank Abakaliki on March 27, 2015, to an Access Bank, Abakaliki, account, where one Maxwell Umahi further moved N100, 000,000 and N300, 000,000 respectively into the accounts of Brass Engineering & Construction Nigeria Limited and Osborn La-Palm Royal Resort respectively. One of the suspects, Chinyere Egwuche, subsequently withdrew the N300 million paid into the account of Osborn La-Palm, which according to her, was used to finance the construction of Osborn La-Palm Hotels in Abakaliki, Uburu and Port Harcourt, while the N100m paid into the account of Brass Engineering and Construction Nigeria Limited was transferred to a certain David Umahi Faith Foundation. 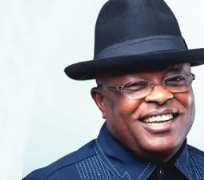 Although investigation is still ongoing, EFCC operatives said the companies to which the funds were transferred were traced to the Ebonyi State governor. - The News.